EXTRACT-CONCENTRATE of BILBERRY And OChANKI regulates activity of a gastrointestinal tract, stimulates a metabolism and possesses the knitting, fixing, diuretic, anesthetizing, antiinflammatory, spasolytic and styptic action. 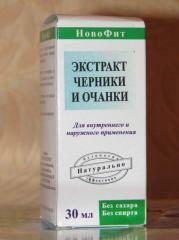 Unbelievable price on Miscellaneous medication (V) in Dnipro (Ukraine) company Medagroprom, OOO. Wide choice of quality products at affordable prices.